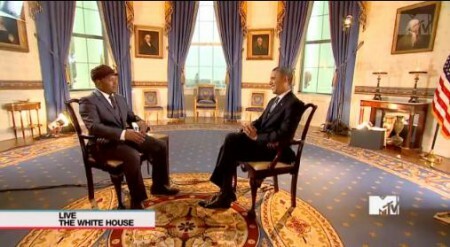 Barack Obama told MTV he wished more music today would be political. President Obama outlined his political agenda during an MTV interview on Friday, but also discussed a more traditional issue for the network: Music. Responding to a question from MTV host Sway Calloway, Obama said he wishes more musicians would make politics part of their music, as many artists did during the Vietnam and civil rights eras of the 1960s and 1970s. “I’d like to see a more explicit discussion of the issues out there,” Obama said. Calloway had asked about the legacy of political music, citing examples ranging from Bob Dylan to Rage Against The Machine. Music is such a “powerful” medium, it could have a huge impact on the political world,” Obama said. “You can set the world on a fire in a positive way,” Obama said.